This project, This Exhibition Will Change Your Life, was created at the end of a year-long Fellowship in the Public Imagination at Yerba Buena Center for the Arts in San Francisco and was presented as part of the final project Public Square in June 2018. It seeks to ask whether our cultural institutions are our new spaces for mental wellbeing and asks visitors to take one of two prescriptions for everyday life, to experience Public Square as a counterpoint to loss, loneliness, depression, anxiety, or even a specific life situation. Individually, these projects hold vital approaches for getting mentally and emotionally savvy: whether that’s connection, movement, attentiveness, lifelong learning, helping others, resilience and empathy, even untethering from our tech. Collectively, they propose that our arts institutions could play a significant role in how we contend with our mental lives. They might even help you change yours. 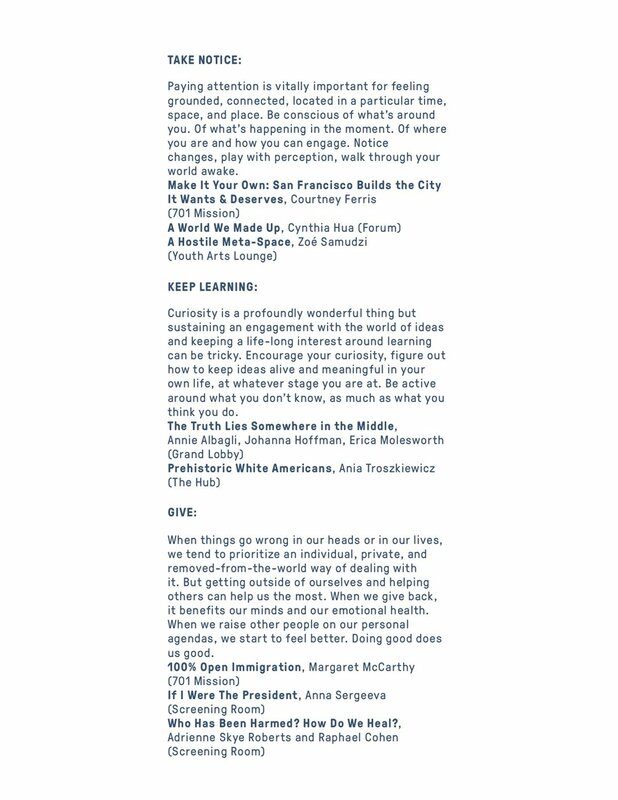 Maybe you made it to Yerba Buena's Public Square on Saturday 2 June and you saw the two Prescriptions for Life and you are looking for the expanded texts. Both are below. Maybe you didn't make it over to Yerba Buena, but you are interested in how our arts institutions have an application in the mental wellbeing realm. Also, read on. What is Public Square if not a place to reimagine what our cultural spaces can be and how we can orientate our lives and even ourselves within them? We know this: our economy, family, community, religion, and education (all the big stuff) are going through profound changes, and our emotional lives, psychological well-being, and sense of how to live are being intimately affected. 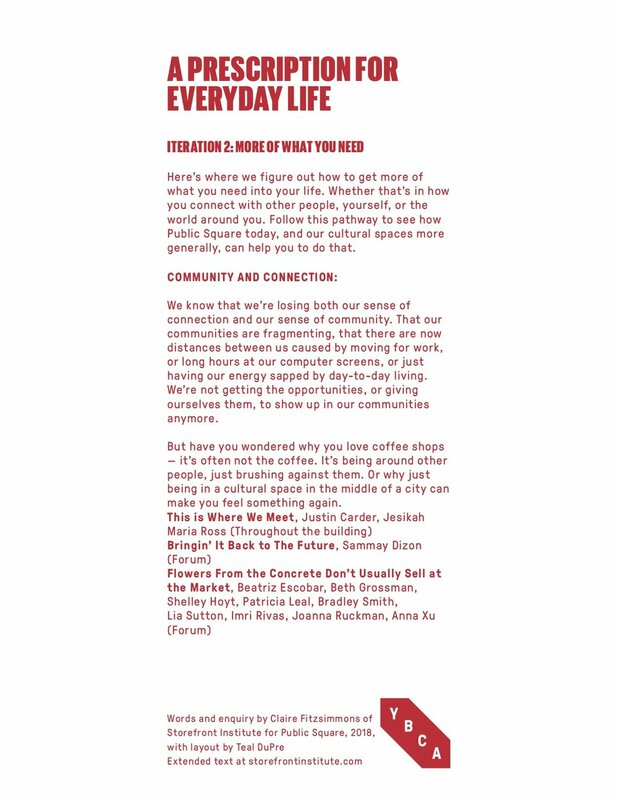 We also know that we are increasingly losing spaces for contact, connection, and purpose as we shift how we physically move through the spaces of our everyday lives. And we know that people are increasingly lonely, depressed, anxious, lost. But do we know this? Our ability to talk about and treat our mental wellbeing is changing. Beyond the usual suspects of medication and talk therapy there’s more, much more – initiatives, spaces and people that can help us in new and creative ways, that have the capacity to make people feel better and good and valued. That allows us to realize that if you feel any of these conditions, others feel it too. Many of the projects proposed for Public Square collectively (some consciously, others not) propose a new role for a cultural space such as YBCA. Because it is the cultural sector that inadvertently holds many of the things that we need to sustain our mental health. We’re taking the New Economics Foundation’s Five Recommendations for Wellbeing, the evidence-based actions that they recommend incorporating into your daily life -- connection, physical exercise, paying attention, life-long learning and helping others -- as an alternative pathway through Public Square. Follow the suggestions below to see whether you can use Public Square as a therapeutic exercise and to build a better approach to your mental wellbeing. The focus here is simple, how to be in contact with other people. It seems so blindingly obvious, but we’ve lost contact with this idea. We now spend an absurdly small amount of time with actual real people and we’re suffering because of that. Connection is one of the most important ideas for combating modern ills. Exercise your body, exercise your mind. Moving releases stress, improves sleep, helps your overall mood, decreases tension, improves self-esteem and combats anxiety and depression. We’ve traditionally separated the mind/body, particularly as culture goers and thinkers. Now we need to rebalance the connection and hierarchy between the two. Paying attention is vitally important for feeling grounded, connected, located in a particular time, space, and place. Be conscious of what’s around you. Of what’s happening in the moment. Of where you are and how you can engage. Notice changes, play with perception, walk through your world awake. Curiosity is a profoundly wonderful thing but sustaining an engagement with the world of ideas and keeping a life-long interest in learning can be tricky. Encourage your curiosity, figure out how to keep ideas alive and meaningful in your own life, at whatever stage you are at. Be active around what you don’t know, as much as what you think you do. When things go wrong in our heads or in our lives, we tend to prioritize an individual, private, and removed-from-the-world-way of dealing with it. But getting outside of ourselves and helping others can help us the most. When we give back, it benefits our minds and our emotional health. When we raise other people on our personal agendas, we start to feel better. Doing good does us good. The title of this project, This Exhibition Will Change Your Life, speaks to our promise and our hope as creative practitioners, and also maybe even as audiences, that something might just shift for us in the moment when we find ourselves in a public place, with an abundance of ideas, and maybe a little direction. Did anything change for you today? 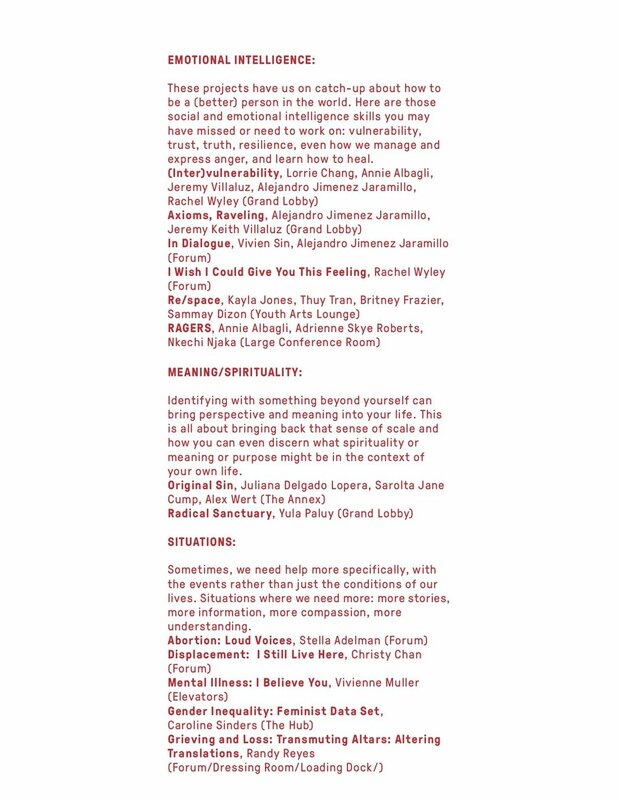 This project offers a reading of Public Square from the perspective of mental wellbeing and asked how we might take the content of the various projects and the framework of YBCA and apply these in the direction of our personal lives. We’re now moving into a world that is moving into answers for our mental wellbeing. We’re now creating and crafting environments and initiatives that are all about how to be a person in the world. Ones that interestingly draw from sectors beyond wellness and psychology to the domains of culture and the humanities. Initiatives that are people-centered, have a deep appreciation of experience and design, are open and accessible to all, and are often playful. Initiatives that can be found here. Today. Other people, or maybe you, are building the frameworks and creating the structures to help people negotiate their lives, from multiple perspectives and in very different ways than what went before. As you read on, your bit is to find the thing that appeals to you, to show up to something and see how it goes. To engage. Here’s where we figure out how to get more of what you need into your life. Whether that’s in how you connect with other people, yourself, or the world around you. Follow this pathway to see how Public Square today, and our cultural spaces more generally, can help you to do that. There’s connection – getting to spend time with other people – and there’s community – getting to spend time with the same people. We know we’re losing both of these. That our communities are fragmenting, that there are now distances between us caused by moving for work or long hours at our computer screens, or just having our energy sapped by day-to-day living. We’re not getting the opportunities, or giving ourselves them, to show up in our communities anymore. But have you wondered why you love coffee shops – it’s often not the coffee. It’s being around other people, just brushing against them. Or why those third spaces, those bits between home and work, are popping up and getting our attention. Or why just being in a cultural space in the middle of a city can make you feel something again. There’s a twin approach to being a person in the world – one side looks out, to how you can connect, find your place in a community, get to a purpose beyond yourself; the other goes inward to who you are and how you function. These projects have us on catch-up about those social and emotional intelligence skills, whether that’s vulnerability, trust, truth, resilience, even how we manage and express anger, and learn how to heal. Identifying with something beyond yourself can bring perspective and meaning into your life. For some, that’s through religion, for others it's finding the non-secular ways we can connect to something greater. This is all about bringing back that sense of scale and how you can even discern what spirituality or meaning or purpose might be in the context of your own life. Sometimes, we need help more specifically, with the events rather than just the conditions of our lives. These situations, experienced individually, caused and produced collectively, where we need more: more stories, more information, more compassion, more understanding. Where we need to know that we are not alone in this. You are not alone in this. Each of these projects at Public Square, some inadvertently, contain within them the potential to help our mental wellbeing. Our cultural institutions already offer the possibilities for creating spaces for personal as much as social change. This approach to Public Square teases out how the two – our mental wellbeing and our cultural spaces - might work differently together. It asks how as visitors we might also shift our role, our way of engaging, even our why for showing up here in the first place. If you feel lost, lonely, depressed, even anxious, would this be the first place you would come?